This 1958 Metropolitan 1500 was purchased from a man in Springfield, Pa. specifically for the exhibit. It had to be lifted by a crane to the second floor of the building so that it could be displayed. Curator Max Moeller said that they haven't decided what will happen to the car after the exhibit closes in October of 2016. In early 2010, the Hagley Museum & Library was the recipient of a donation of nearly 1,300 linear feet of automobile and transportation advertisements, trade catalogs, and ephemera from the personal collection of Z. Taylor Vinson. With its 67,000 items that represent 1,900 different car manufacturers, this collection documents more than a century of automotive marketing and advertising from companies around the world. 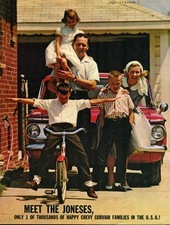 A 1960 print brochure from Corvair illustrates how automobiles were marketed. “It was a struggle at first to decide what story we were going to tell,” Moeller explained. 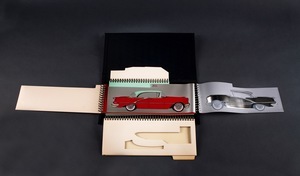 Moeller led the Hagley staff's efforts to sift through the materials and assemble an exhibit of some of the most compelling materials to tell the story of automobile advertising and how it is inexorably connected to the American Dream. After several years of work, the final draft of that story is on display in “Driving Desire: Automobile Advertising and the American Dream,” which debuted on Oct. 2 and runs through Oct. 2, 2016. According to Moeller, the exhibit explores how automobile advertising influences the buying decisions that Americans make. There are more than one hundred artifacts, rare original advertisements, and historic images included on display, many of them from the personal collection Vinson. The exhibit is a joyride through the decades, as the print ads, brochures, magazine stories, and commercials show how cars changed through time. The exhibit is divided into six major themes that will be familiar to any car buyer—luxury, performance, safety, style, economy, and patriotism. The exhibit includes brochures and other printed materials from automobile manufacturers. Moeller explained that these themes emerged as he was going through the thousands of brochures, advertisements, and other materials that were produced. ~ “Unless you go in a Mercedes-Benz you haven't arrived,” states one of that company's advertisements in 1971, playing up on the status of that car. ~ One ad from the 1930s explores “Why Spencer Tracy owns a DeSoto.” The ad explains that people like Tracy, Ginger Rogers, and Walt Disney drive a DeSoto...so why shouldn't you? ~ “0-60 in 3.7 seconds. Need I say more?” reads another display, touting the performance of a car. Women were making appearances in automobile ads as far back as the 1890s, when they were depicted in ads from the Duryea Motor Wagon Company in Springfield, Massachusetts. Women and minorities were under-represented in automobile advertisements for decades. One display in the luxury section of the exhibit focuses on DuPont Motors, Inc., which manufactured a series of luxury cars between 1919 and 1931. Moeller explained that a 1928 model G found the largest audience of any of the DuPont Motors, Inc. cars. Moeller said that as he was working on the exhibit, one of the things that he noticed was how unfair the representations of women and minorities were in advertising. He wanted to make sure that one section of the exhibit would explore this so that people will be aware of the shortcomings of automobile advertising that existed. 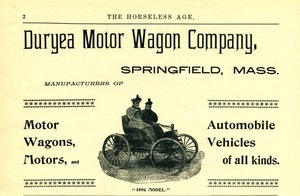 Women were making appearances as far back as the 1890s, when they were depicted in ads from the Duryea Motor Wagon Company in Springfield, Massachusetts. But automobile ads have overwhelmingly been geared toward men, and the ones that do target women often focus on things like the color of the cars, or the compliments that friends will make about the cars. Minorities were really under-represented in automobile advertising. For decades, the rare appearances that minorities make are not as potential car purchasers, but rather as people who are watching other people—mostly white men—enjoy their vehicles. Moeller wanted to bring attention to the fact that women and minorities were unfairly overlooked. “I felt that this was important because it was an eye-opening revelation to me,” he explained. The exhibit is geared toward all ages, and every effort was made to make the exhibit as interactive as possible. There are iPads available at one station so that visitors can flip through some of the brochures and catalogs that are featured in the displays. One station in the exhibit gives children and adults alike the chance to test their skills at identifying performance engines just by the sound that their engines make. Another station asks visitors to match the slogan with the car company that made it famous. Visitors can also spin a wheel and attempt to match the safety feature with the first year that it was widely used. The centerpiece of the exhibit is a 1958 Metropolitan “1500” car that had to be lifted by a crane and placed on the second floor of Hagley Museum. The car was designed by Nash Motors. Several years were spent putting the exhibit together. Some of the material came from Hagley's own library. “We already had a pretty strong collection of automotive literature in our library,” Moeller explained. Most of the materials, however, came from the personal collection of Vinson, who spent a lifetime at work on this hobby of accumulating ephemera exploring transportation history. “He started collecting when he was very young,” Moeller explained. Vinson's interest in automobile literature can be traced back to when he was just seven years old, when he was given a 1938 Ford trade catalog. Soon, he was collecting any literature he could obtain from dealerships. Vinson, a native of West Virginia, graduated from Princeton University and worked in advertising in New York City until he graduated from the University of Virginia Law School in 1961. He went on to work as a senior lawyer with the National Highway Traffic Safety Administration in 1967, a position he held until his retirement in 2003. As he grew older, Vinson's collection grew to include so much material that he had to build an addition to his Virginia home to accommodate it all. 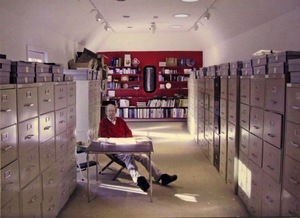 He referred to the storage facility as his “Autotorium.” He passed away at the age of 76 in 2009, and the collection was donated to the Hagley Library early in the next year so that his dream of having it available to the public could come true. Moeller, who has been with Hagley Museum for the last nine years, said that the exhibit is a natural fit for Hagley, whose 235-acre property was once the site of the gunpowder works founded by E.I. du Pont in 1802. The library documents the history of business and American enterprise. Moreover, the Du Pont Company controlled General Motors for a period of time, and also manufactured products that were used widely in the automobile industry. He hopes that the exhibit will be an enjoyable trip through time for visitors. And while it's not intended as a scholarly exhibit, if visitors do learn a little something about how automobile advertising works in our society, that would be good, too. “I do hope that people walk away thinking more critically about he process they go through when buying a car,” Moeller explained. “Driving Desire: Automobile Advertising and the American Dream” runs through Oct. 2, 2016. This exhibit is open daily at 10 a.m. A ticket to the museum is $14 for adults, $10 for senior citizens and students, and $5 for children between the ages of 6 and 14. Tickets to the exhibit only are $6 for adults and $2 for children. Visit www.hagley.org for seasonal hours.